The corpse of Clyde Johnson. August 3, 1935 . Yreka, California. Gelatin silver print. Real photo postcard. 3.1/2 x 5 3/8 in. 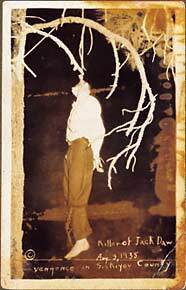 Etched in the negative, "Killer of Jack Daw Aug 3, 1935 vengence in Siskiyou County."